Comfort matters most. Having a space that is consistently at the right temperature doesn’t just keep you comfortable…it improves your home environment. One simple way to make it happen? Radiant floor heating. This heating method has been used for hundreds of years, ensuring that home and building owners enjoy a stable and reliable temperature. At Heating Ontario, we install radiant floor heating systems all over the city. That includes everything from the pipes to the thermostat and even NTI boiler installation. We take care of it all so you can live stress free. There are many benefits to radiant floor heating. This particular heating method makes it possible to keep each room at your desired temperature. Not using a certain area? Lower the heat setting. Only use a room during evening hours? Adjust accordingly. This process allows you to save money on your monthly energy bill, giving you continued comfort without overspending. How does it work? Radiant floor heating heats up all surfaces in a room to the same temperature. That includes the floors, walls, furniture, and even the people inside. This ensures maximum comfort and less heat loss than other forms of heating. Are you considering radiant floor heating for your own home or office building? Leave the installation process to our Heating Ontario professionals. We excel at bringing radiant floor heating to residential and commercial areas throughout Toronto and the GTA. What can you expect? Radiant floor heating uses warm water that is circulated through tubing in the floor. During installation, one of our heating contractors will install the necessary tubing underneath your existing floorboards. The warm water is then moved using pumps and vales that are heated by your NTI boiler. There are a number of boilers for you to choose from. They can be heated by natural gas, propane, electricity, or even wood. It all depends on the method that best suits your preferences and individual space. Since there are so many options, one thing is for certain: you can always feel good about your choice. At Heating Ontario, we understand how important your boiler is. In order for a radiant floor heating system to work effectively, it requires a boiler that won’t let you down. Don’t worry – our team won’t let you down either. We have extensive knowledge of both boilers and boiler installation. So, rely on our experience. 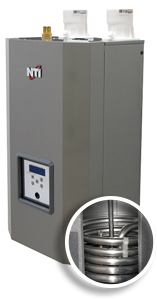 We have handled countless NTI boiler installations over the years. And even more heating and cooling services! If you are considering making the switch to radiant floor heating…. look no further. Our Heating Ontario professionals are ready to answer all of your questions. Not sure what type of boiler you need? Or what the installation process will entail? Simply get in touch with one of our representatives to find out more and learn about your options. Breathe easy with quality boiler installation. Our Heating Ontario team knows how to keep your home or commercial building at a comfortable temperature day in and day out. Let us make your life simpler. When you need NTI boiler installation services, put your trust in our experienced professionals. We are ready to improve your space. If you need more information about your heating and cooling system, contact us at: (click-to-call): 647-591-2683. At Heating Ontario, our professional and experienced staff members understand how to keep your home at the right temperature.